Donald R. Getty School is now open! This kindergarten to Grade 9 school opened in the fall of 2017 and is located within the Chappelle neighbourhood on 8102 Chappelle Way SW.
For more information, visit the ESPB website. Please note: this project is the responsibility of Alberta Infrastructure. The Collections and its agents have no control over construction timelines. 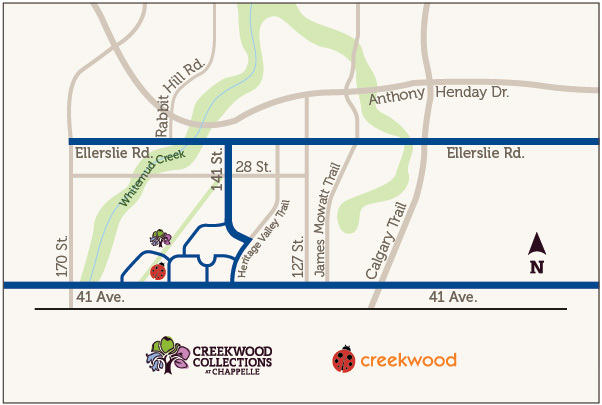 Through the brand new 41 Avenue SW exchange, Calgary Trail and Gateway Boulevard are just minutes from The Collections. Hop on the Whitemud, skip over to the Anthony Henday, and be where you need to be in no time. Local amenities are found here.